Irish Whiskey reborn from a Sauterne wine cask. Jack Teeling founded the Teeling Whiskey Company in 2012, with a mission to challenge the norm by crafting Irish Whiskey with a bigger depth of personality and character than the current mass-market options, and to become Ireland's leading independent Irish Whiskey producer. Jack Teeling comes from a family with a long tradition associated with Irish Whiskey. Take for example the Cooley distillery, which was founded by John Teeling, and Walter Teeling in 1782 who setup a distillery on Marrowbone Lane in Dublin. 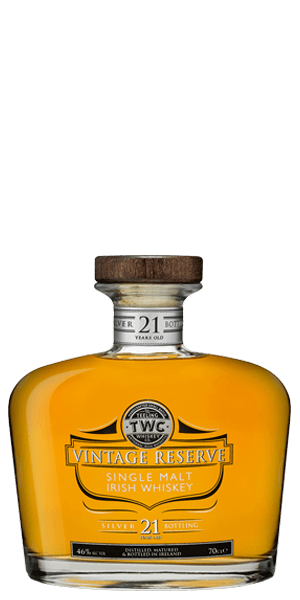 Teeling Silver Reserve 21 Year Old 1991 Single Malt consists of 21 year old Whiskey distilled in 1991 and aged firstly in Bourbon casks and finished for 12 months in Sauterne wine casks. It is said to be the first Irish Whiskey to be finished in a Sauterne wine casks, and that it contains some of the oldest Single Malt Irish Whiskeys ever bottled. Apparently this "Silver" reserve is a celebration of everything good about Irish whiskey – from its robust nose to its fully rounded and balanced array of flavours. What does Teeling Silver Reserve 21YO 1991 taste like? The Flavor Spiral™ shows the most common flavors that you'll taste in Teeling Silver Reserve 21YO 1991 and gives you a chance to have a taste of it before actually tasting it. Smooth, honey, crisp saltiness, a tad spicy, leafy notes.